Ephesus had great natural advantages that made it ideal for prosperity and growth. Its access to the Aegean Sea brought it ships from far and wide. Its location on the great east-west road that ran from it to the Euphrates River also contributed to it being a chief hub of trade and a place where people wanted to live. Ephesus' many attributes and advantages made the city an ideal target for Apostle Paul's evangelistic efforts. Paul visited the city during his second and third missionary journeys, staying in the city a total of more than three and one-half years! Yet for all of Ephesus' attributes, the one that has stood the test of time is it being the place of one of the wonders of the ancient world. 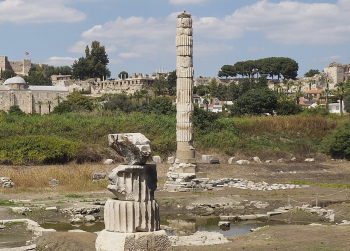 The one building in Ephesus that surpassed all the rest in magnificence and fame is the Temple of Artemis or Diana. It is considered one of seven wonders of the ancient world, along with the lighthouse at Alexandria, the Colossus of Rhodes and Egypt's pyramids. In its greatest manifestation, which was funded entirely by the people of Ephesus, it measured 450 feet long (137 meters) by 225 feet wide (69 meters) and 60 feet (18 meters) high. The upper part of this architectural wonder was held up by more than 127 columns. World empires from Babylon to Beast! Most influential Biblical pagan gods! This pagan temple glittered in brilliant beauty at the head of the harbor, and was reckoned by the ancients as one of the wonders of the world. The sun, it was said, saw nothing in his course more magnificent than Diana's Temple. Its honor dated from a remote antiquity. The foundations were carefully laid, with immense substructions, in the marshy ground. Architects of the highest distinction were employed in the construction of the temple. The quarries of Mount Prion supplied the marble. All the Greek cities of Asia contributed to the rebuilding of the structure around 550 B.C. (the first building had been flooded and destroyed). Croesus, the king of Lydia and ruler of Ephesus, himself lent his aid. The work thus begun before the Persian war was slowly continued even through the Peloponnesian war, and its dedication was celebrated by a poet contemporary with Euripides. The building, however, was not destined to remain long in the beauty of its perfection. The fanatic Herostratus set fire to it in 356 B.C. on the same night in which Alexander the Great was born. The third version of temple, however, the greatest and grandest of them all, would help spread the worship of the pagan deity Diana such that the Ephesians would claim, "all Asia and the world worship" (Acts 19:27). It is the third, and last, rebuilding of the temple that made it an ancient world wonder. The national pride in the sanctuary was so great that, when Alexander the Great offered the spoils of his eastern campaign if he might inscribe his name on the building, the honor was declined. The Ephesians wisely waited until Alexander's death and then began rebuilding their pagan monument in 323 B.C. The temple was redesigned with new and more sumptuous magnificence. The ladies of Ephesus even contributed their jewelry to the expense of the restoration. The Ephesians never ceased to embellish the shrine of their goddess, continually adding new decorations and subsidiary buildings to the ancient wonder, with statues and pictures by the most famous artists. This was the temple that kindled the enthusiasm of Apostle Paul's opponents (Acts 19) and was still the rallying point of Heathenism in the days of John and Polycarp. In the second century we read that it was united to the city by a long colonnade. This wonder of architecture, however, would not stand much longer. In 268 A.D. it was plundered and laid waste by the Goths, who came from beyond the Danube in the reign of Gallienus. It sank entirely into decay in the age when Christianity was overspreading the Empire. Its remains can be found in medieval buildings, in the columns of green jasper which support the dome of Sophia, or even in the naves of Italian cathedrals. If the Temple of Diana at Ephesus was magnificent and an ancient wonder, the image enshrined within the sumptuous enclosure was primitive and rude. We usually conceive of this goddess, when represented in art, as the tall huntress, eager in pursuit. Such was not the form of the Ephesian Diana, though she was identified by the Greeks with their own mountain goddess. The image use for the temple may have been intended to represent Diana in one of her customary characters, but it reminds us rather of the idols of the far East, and of the religions which love to represent the life of all animated beings as fed and supported by the many breasts of nature. The figure which assumed this emblematic form above was terminated below in a shapeless block. The material was wood. A bar of metal was in each hand. The dress was covered with mystic devices, and the small shrine, where it stood within the temple, was concealed by a curtain in front. Yet, rude as the image of Artemis (Diana) was, it was the object of the utmost veneration. It was believed to have "fallen down from the sky" (Acts 19:35). Thus it was the object of the greater veneration from the contrast of its primitive simplicity with the modern and earthly splendor which surrounded it. It was the model on which the images of Diana were formed for worship in other cities in the Roman world. is one tall column created with site fragments. This ancient wonder and the pagan services it hosted remained under the Romans as they had been since the period of Alexander. If any change had taken place, greater honor was paid to the goddess, and richer magnificence added to her sanctuary, in proportion to the wider extent to which her fame had been spread. How great was Alexander's empire?